Two minutes to Trafalgar Square as the pigeon flies, St Martins Lane Hotel is ideally located for the theatres that surround Leicester Square. Part of the glamorous Morgans hotel group, Philippe Starck's eclectic design still stands the test of time. Cutting-edge design by Philippe Starck close to Covent Garden. One of the first design hotels, St Martins Lane hotel opened in 1999 amidst much fanfare and a cutting-edge design by renowned French designer Philippe Starck and it certainly hasn't lost any of its appeal. It continues to impress with great service and high standards - the attention to detail at St Martins Lane is second to none and a complimentary upgrade is smoothly executed whenever possible. The hotel's Light Bar is a real scene with people coming to pose and people watch and the famous Asia de Cuba restaurant comes highly recommended. Designer touches are everywhere - from the gnome chairs and fur throws on ornate divans to the oversized wooden chess set in the hotel lobby - making a stay here quite a statement in urban chic. Try the tuna with the wasabi mash at the famous Asian fusion restaurant. The venue is chic and dominated by fat, cylindrical pillars, each quirkily adorned with a different element. Situated within Morgans Hotel Group's fashionable St Martins Lane hotel, this stylish split-level restaurant serves a cuisine that combines Asian and Cuban elements - the tuna with the wasabi mash is a must - and has a Rum Bar that holds the largest selection of "sipping" rum in London. Prices are hardly restrained here, but the type of celebrity clients and fat cat bankers it regularly attracts don't seem to notice. Also available are bento boxes for lunch or pre-theatre takeaway - handy if you're popping in to the Duke of York's Theatre opposite or the Coliseum a few doors down. Some of the best cocktails in London, striking Philippe Starck decor, and a cool, chic vibe. The Light Bar on the ground floor of the stylish St Martins Lane hotel has some of the best cocktails in London - they make a mean Caipirinha - striking Philippe Starck decor, and a cool chic vibe. All this comes at a price but it's worth it for the standard of cocktails, the designer interior, and the people watching. Open to residents and non-residents alike, it's a convenient place to stop by for a couple of cheeky after dinner cocktails. It's the sort of place where you might pop in for a quick drink after the theatre on a Saturday night and end up staying for three hours - just bring your fat wallet with you if you do! Hotel guests have free use of the Gymbox treadmills, bikes and weights. Guests of the St Martins Lane Hotel get to use the Gymbox facilities next door which offer far more than the average hotel gym with plenty of treadmills, bikes, elliptical, circuit machines and weights. Styled like a night club, the gym is dark with neon lights illuminating the walls, and from around 6.30pm onwards a live DJ picks up the beat. Boxing is also a theme and they run boxing classes as well as Pilates classes. There are televisions to distract you from the effort of your workout and it's clean and well stocked with water and towels for guests. Oak-panelled snug, perfect for afternoon tea or a G and T.
An oak-panelled snug at St Martins Lane , The Den is the perfect place to enjoy afternoon tea, curl up with a book, play a game of backgammon or catch up with friends over a gin and tonic. Afternoon tea is platefuls of savoury bites including poppy seed and pumpkin choux, sundried tomato focaccia and honey roast ham and Somerset Cheddar baked brioche, followed by sweet treats such as mixed berry tarts, coconut macaroons and Greek yoghurt mousse with passion fruit and guava sauce. An ideal meeting place in the heart of Covent Garden, The Den is filled with comfortable leather sofas and surreal art works. 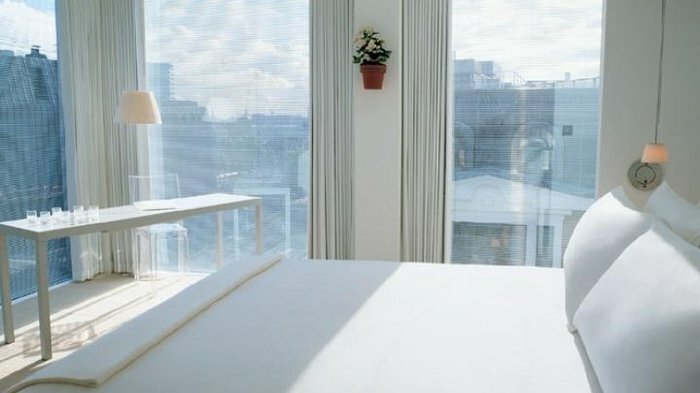 From cheap budget places to stay to luxury 5 star suites see our deals for hotels, including Hilton London Islington Hotel from 68% off.